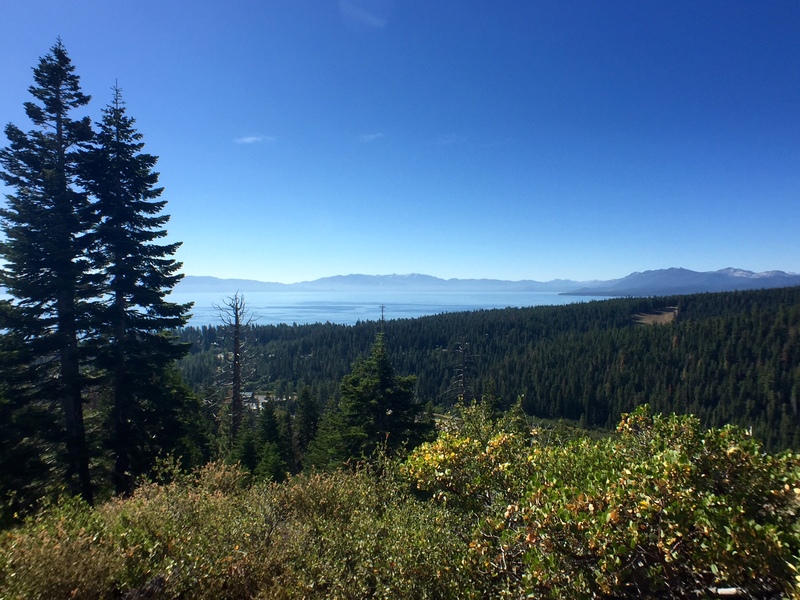 Even a short time in a beautiful place like Lake Tahoe can refresh the spirit–and we packed a lot into our two days there! 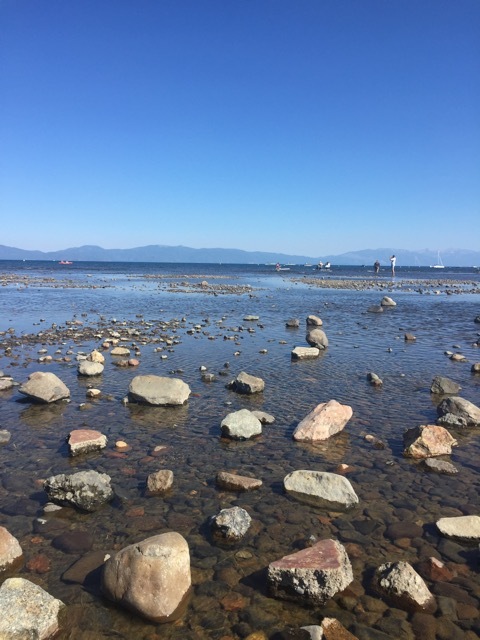 We arrived in Tahoe City on a Sunday and took a walk to Commons Beach, where live bands were playing at an outdoor music festival. We dipped our feet in the cool water of Lake Tahoe and listened to great blues music while watching adults, children, and dogs enjoy the beautiful weather. 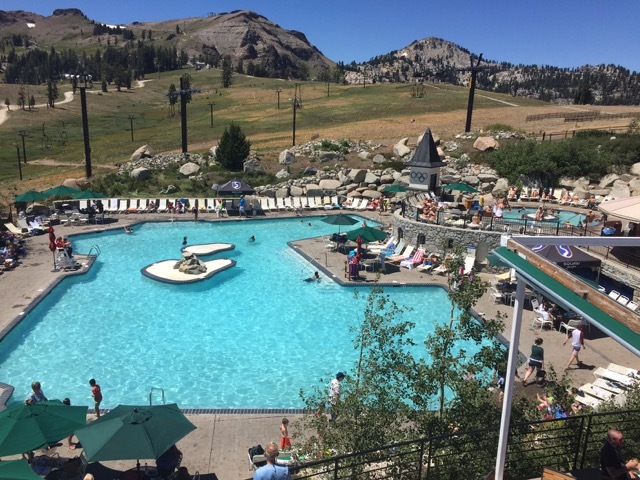 It was party atmosphere, with people picnicking and sampling food and drinks from the many vendors set up at the park–a perfect way to shake off the city cobwebs and relax into the Tahoe vibe. Our base for our adventures was Basecamp Hotel, a fun place that combines the best of glamping with a convenient in-town location, making it super easy to walk to restaurants, the lake, and hiking trailheads. We especially loved the two outdoor fire pits–the perfect place to roast marshmallows for s’mores or sipping a glass of wine. 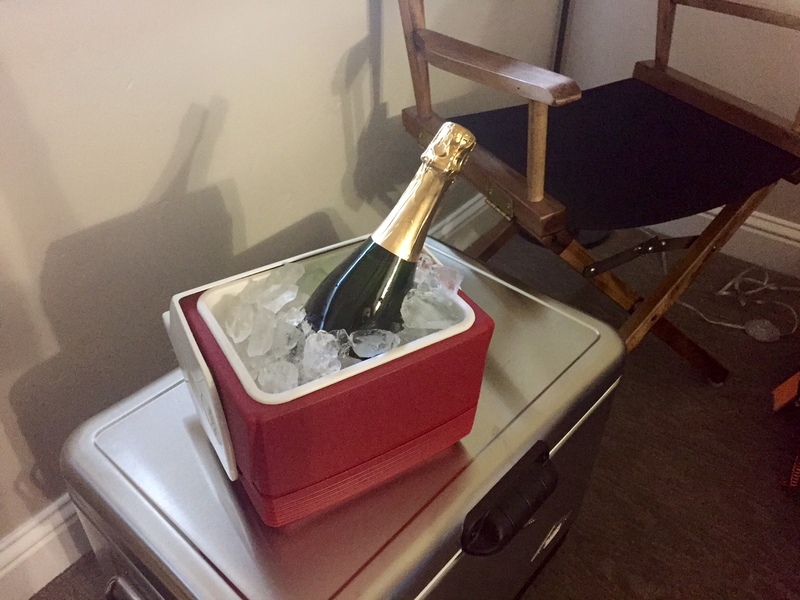 The hotel even provides cute Coleman coolers to chill your champagne, which we did. Props to my honey for bringing the champagne! It was hard to leave Basecamp, but the trails were calling to us, so we put on our sneakers (ok, I put on my sneakers, my husband wore his hiking boots) and headed to the South Rim trailhead, just down the road from our hotel. After a short incline, we reached the rim, which leveled off nicely into a lovely forest trail with, natch, amazing views. The trees kept us cool, even on a hot day, and we we brought plenty of water and snacks to keep us fueled. My husband made fun of the Roltini I brought, but hey, there’s nothing wrong with a mozzarella stick wrapped with prosciutto when you’re hungry! We watched until the clouds dissolved and kept hiking to a dramatic outcropping of rocks where we rested and tried not to get vertigo. After our hike, we treated ourselves to a great burger and beer at the Tahoe Mountain Brewing Company. Relaxing on their patio was the perfect ending to our 8 mile trek. The next day we made fresh waffles for breakfast at Basecamp, then hit the road, for a hike recommended by Lauren, our very friendly and knowledgeable insider at the hotel. 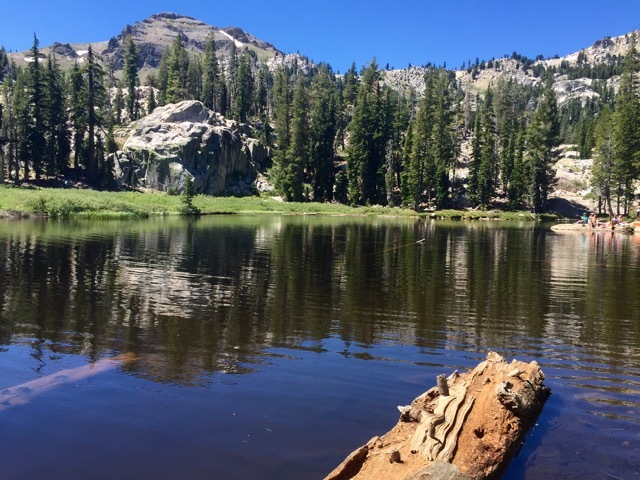 The Shirley Lake hike starts at the base of Squaw Valley Mountain, so you get to see what is covered up by all the winter snow, and it’s gorgeous! 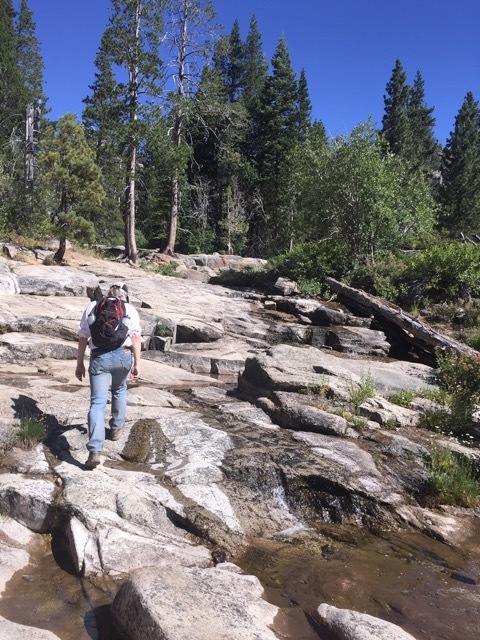 Not for the faint of heart, the trail is pretty steep, but you are rewarded by the views of waterfalls all along Squaw Creek, affording many places to stop and refresh yourself. About a mile or so up the trail, the trees give way to rock, making it tricky to stay on the trail. As one fellow hiker put it, “There’s no wrong way up,” which made us feel better, but the painted trail marks were very comforting to follow. There was very little shade at this elevation, so we stopped for frequent rest and water breaks. Hiking up had taken us twice as long as we had thought it would, so we were not looking forward to having to hike back down the steep slope. Luckily, we didn’t have to! 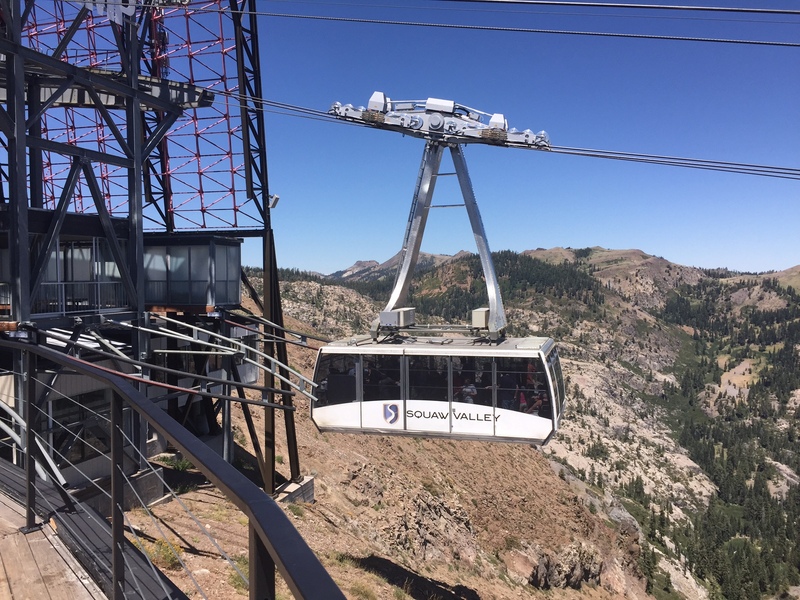 During the summer, Squaw Valley opens their peak to visitors, who take a tram up to the top of the ski slope to their pool and restaurant resort. 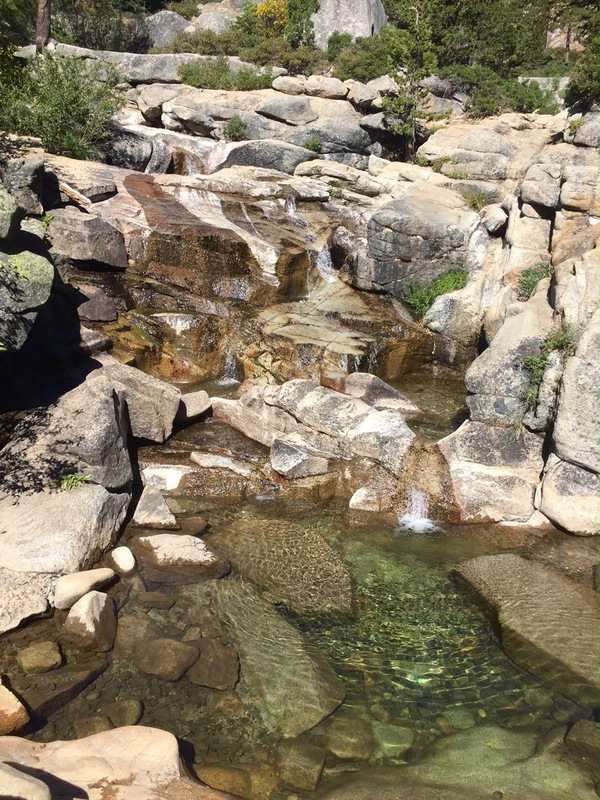 It took us another half hour to hike from Shirley Lake to the tram and pool; we must have looked like straggly hoofers to the families frolicking in the pristine mountainside water. Next time I am definitely bringing my bathing suit. 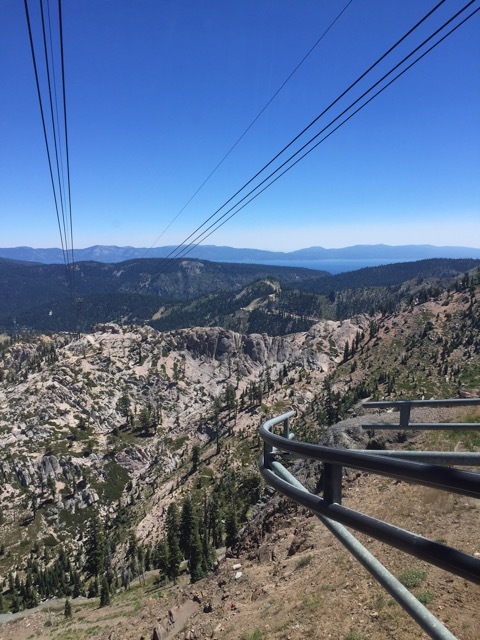 The tram saved our weary legs–and gave us a spectacular view going back down the mountain. It was worth every step and I can’t wait to do it again! 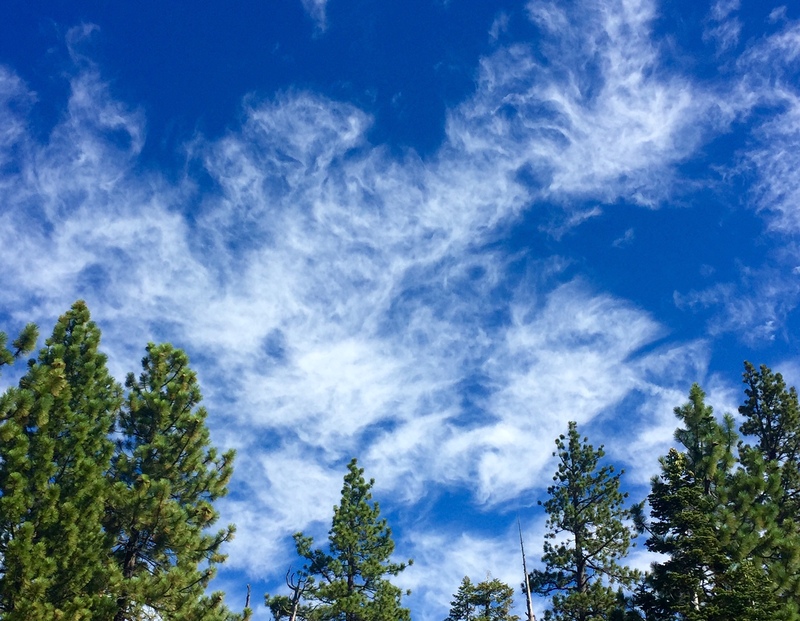 I hope you enjoyed this post–let me know where are your favorite places to hike? 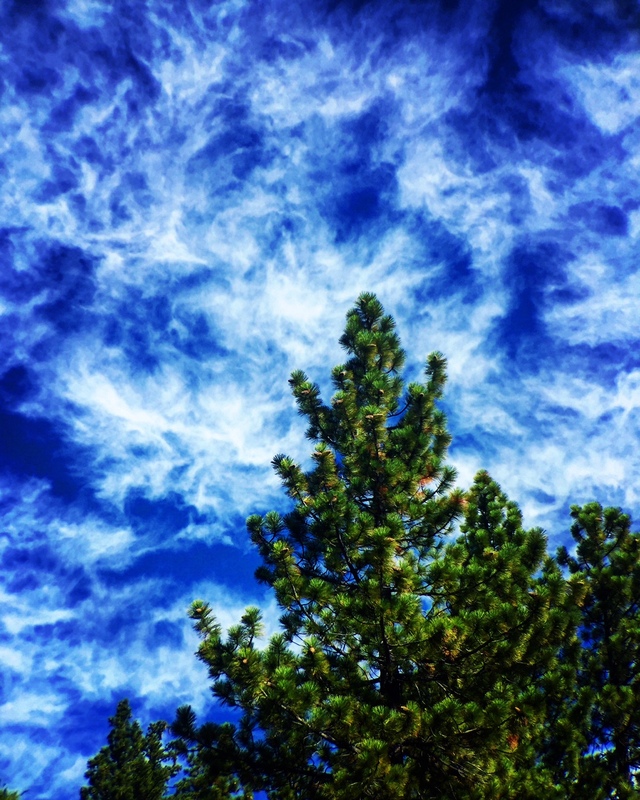 This entry was posted in Bay Area Hikes, Uncategorized by Candy Shue. Bookmark the permalink.